Christmas is the perfect time to gather with loved ones, celebrate the festive season and bond with one another. Quality family time won’t be the same again with the launch of The ToDo Game, a collection of creative, innovative and fun activities for families to do together. Sydney couple Alexandra Drury and Dave Oswell and their six year old daughter Freya, created the game as a way to help families rediscover the elements of ‘together time’ that, in this technological age, many of us often neglect. The game has been designed to encourage families to reconnect, spend more quality time together and have some good old fashioned fun free from smart phones, ipads, computers and TV. The ToDo Game is aimed at families with children aged between five and thirteen. There is an educational element woven throughout, but the game primarily aims to encourage playfulness, creativity, and the fostering of meaningful conversations between parents and their kids. Each game involves the drawing out of a card at random, with an activity for all family members to complete together. The games take anywhere from 30 minutes to an hour, depending on the card that is drawn. Unlike traditional board and card games, there are no right or wrong answers, nor luck involved. Imagination and a willingness to participate are all that’s required. The ToDo Game is about having a go, learning about one another, laughing and growing together. It’s also the perfect gift for kids and families. Interestingly, despite only officially launching in September this year, The ToDo Game has been announced as finalists in both the ‘Gift’ and ‘Kids, Toys & Games’ categories at the GALA 2017 - Gift & Life Instyle Awards, hosted by Reed Gift Fairs. 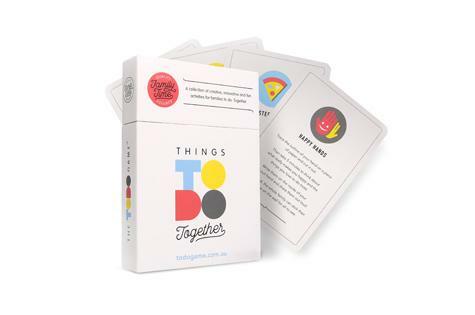 It appears the ToDo game is shaping up to become one of this year’s ‘must have’ Christmas gifts! The ToDo Game proudly donates some of the proceeds from each sale to Their Beautiful Game – a not-for- profit organisation that provides sports equipment to disadvantaged children living in hardship both in Australia and overseas. The ToDo Game is available at Concilio, East Coast Lounge, Inside Home &amp; Gifts Launceston, La’Quar, Prompt Education, Sam &amp; Sloan, The Hunted Co, Third Drawer Down, Toys and Tales, and online at www.todogame.com.au and www.hardtofind.com.au. Look fab with the help of these brushes!